Deloitte LLP and its subsidiaries serve clients all over the world by helping them solve their toughest business problems. 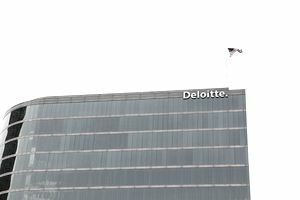 Deloitte focuses on four key areas — audit, financial advisory, tax and consulting. At Deloitte, they have a highly professional group of people working to address each client's needs. According to Bloomberg's BusinessWeek and Vault, Deloitte has consistently been rated as one of the top internships available for students. Deloitte offers a variety of internships and work/study programs for undergraduate and advanced degree students. Students are able to get a chance to experience a wide range of opportunities in a multidisciplinary professional services firm. Learning the business from such a leader in the field provides students with a strong foundation and a chance to obtain the knowledge and skills that organizations seek in their entry-level candidates. If you are a student who has not only excelled in your business courses in college but someone who has also developed strong leadership skills through academic coursework, co-curricular activities, and you really enjoy tackling problems and coming up with well thought out solutions, you could be exactly what Deloitte is looking for in its next group of interns. An internship with Deloitte can help to further hone your skills and position you for a full-time job directly out of college. There’s not much grunt work for those selected to do an internship with Deloitte so interns don’t have to worry about what they need to do to keep busy or about spending the majority of their time making coffee or filing papers. Current interns and co-ops have an opportunity to work side-by-side with Deloitte’s current full-time employees as part of a client service team in the audit, advisory, tax, financial advisory services, consulting or enabling departments. During their first week, interns will spend their time in training and will be assigned a mentor that will help them get started working for the organization. The intern’s first week is devoted to training and they will be assigned a mentor who will help them get acclimated to both the work and the organization. Deloitte has even been named one of Vault’s Top Ten Internships for 2011 out of a pool of 821 programs. The criteria of the high rating were based on several factors including mentorship availability, career advancement opportunities, intern involvement/capacity for learning, compensation, perks, industry clout and work culture. It is also estimated that approximately 75% of interns are offered full-time employment after graduating from college. Deloitte seeks college juniors with a minimum GPA of 3.2. In addition to academic success, Deloitte also looks for candidates with proven leadership, strong analytical and communication skills, and an ability to work in a team. Non- U.S. citizens are welcome to apply. The Global Universities Program: Global Universities Program (GUP) provides opportunities for international students to begin a career in their home country or a country of interest where they are eligible to work and where they are fluent in the local language. Deloitte also offers some excellent tips for interviewing that you will definitely want to check out.